This article is about the North American horned lizard. For the Australian horned lizard, see thorny devil. Horned lizards (Phrynosoma), also known as horny toads or horntoads, are a genus of North American lizards and the type genus of the family Phrynosomatidae. The common names refer directly to their flattened, rounded body and blunt snout. The genus name Phrynosoma means "toad-bodied". In common with large true frogs and toads, horned lizards tend to move sluggishly, making them easy to catch; this may also avoid triggering attacks by predators. They are adapted to arid or semi-arid areas. The spines on the lizard's back and sides are made from modified reptile scales which prevent the water loss through the skin, whereas the horns on the head are true horns (i.e. they have a bony core). Of the 22 species of horned lizards, 15 are native to the United States. The largest-bodied and most widely distributed of the US species is the Texas horned lizard. Nota bene: In the above list, a binomial authority or trinomial authority in parentheses indicates that the species or subspecies was originally described in a genus other than Phrynosoma. Texas designated the Texas horned lizard (Phrynosoma cornutum) as the official state reptile in 1993  and the " TCU Horned Frog" is the mascot of Texas Christian University in Fort Worth, Texas. TCU is the only known athletic team with the horned lizard as a mascot. ^ Middendorf III, G.A. ; Sherbrooke, W.C.; Braun, E.J. (2001). 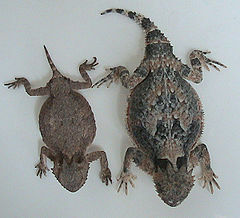 "Comparison of Blood Squirted from the Circumorbital Sinus and Systemic Blood in a Horned Lizard, Phrynosoma cornutum". The Southwestern Naturalist. 46 (3): 384–387. doi: 10.2307/3672440. JSTOR 3672440. ^ a b c Sherbrooke, W.C.; Middendorf III, G.A. (2001). "Blood-Squirting Variability in Horned Lizards (Phrynosoma)" (PDF). Copeia. 2001 (4): 1114–1122. doi: 10.1643/0045-8511(2001)001[1114:BSVIHL]2.0.CO;2. JSTOR 1448403. ^ a b c Sherbrooke, W.C.; Middendorf III, G.A. (2004). "Responses of Kit Foxes (Vulpes macrotis) to Antipredator Blood-Squirting and Blood of Texas Horned Lizards (Phrynosoma cornutum)". Copeia. 2004 (3): 652–658. doi: 10.1643/CH-03-157R1. JSTOR 1448486. ^ Hodges, W.L. (2004). "Defensive blood squirting in Phrynosoma ditmarsi and a high rate of human-induced blood squirting in Phrynosoma asio". The Southwestern Naturalist. 49 (2): 267–270. doi: 10.1894/0038-4909(2004)049<0267:DBSIPD>2.0.CO;2. JSTOR 3672697. ^ Sherbrooke, W. C. (2000). "Sceloporus jarrovii (Yarrow's spiny lizard) Ocular Sinus Bleeding". Herpetological Review. 31: 243. ^ Leache, A. D.; J. A. McGuire (2006). "Phylogenetic relationships of hores lizards (Phrynosoma) based on nuclear and mitochondrial data: evidence for a misleading mitochondrial gene tree" (PDF). Molecular Phylogenetics and Evolution. 39 (3): 628–644. doi: 10.1016/j.ympev.2005.12.016. PMID 16488160. ^ Pianka, Eric; Hodges, Wendy. "Horned Lizards, Part 2". uts.cc.utexas.edu. University of Texas. Retrieved March 1, 2015. ^ Godfrey, Ed (December 20, 2014). "Center for Biological Diversity wants Texas horned lizard declared an endangered species in Oklahoma". The Daily Oklahoman. Retrieved November 5, 2018. ^ "Phrynosoma ". The Reptile Database. www.reptile-database.org. ^ "State symbols". Wyoming Secretary of State's Office. 2011. Archived from the original on September 6, 2011. Retrieved January 22, 2011. 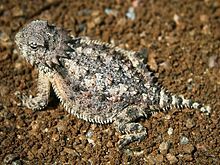 ^ Texas Horned Lizard. State Symbols USA. Retrieved on 2016-10-25. Wikimedia Commons has media related to Phrynosoma.